I am a native of Virginia, which traces its beginnings to Jamestown, named after King James I of Ireland and England, who granted the Virginia Company a charter in 1606. 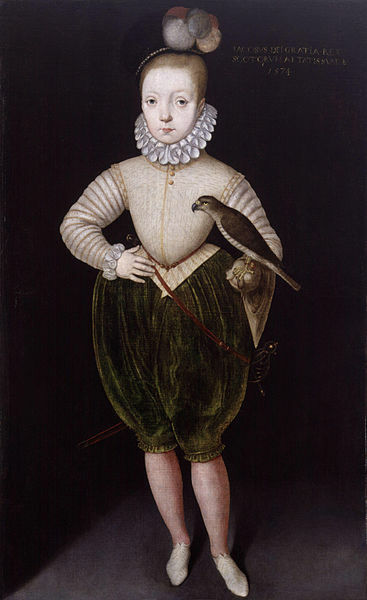 He had also ruled Scotland as King James VI since 1567, from the age of thirteen months. 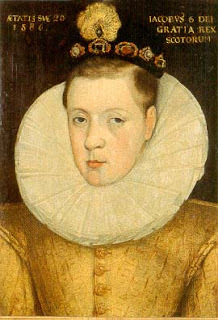 James was the son of Mary, Queen of Scots, who had been forced to abdicate in her infant’s favor (when she married her husband’s likely murderer). James reigned over all three crowns until his death in 1625. And he was a flaming homosexual. When he was fourteen (see portrait at right), James fell in love with a Catholic Frenchman, Esmé Stewart, who was nearly three times his age. The besotted James made Esmé the only duke in Scotland, the 1st Duke of Lennox. According to eyewitness accounts, he was “in such love with him as in the open sight of the people oftentimes he will clasp him about the neck with his arms and kiss him." The disapproving Scottish nobles first made Lennox choose between James and his Catholicism (he chose James), then eventually forced Lennox to flee back to France. James comforted himself by writing Scottish poetry (see second portrait of an older and wiser Scottish King). In 1607, the same year Jamestown was founded, he attended a jousting tournament, where he saw 17-year-old Robert Carr thrown from a horse, breaking his leg. James rushed to his aid and promptly fell in love. James made Carr a gentleman of the bedchamber and gave him many gifts, including the title 1st Earl of Somerset and a country estate. Seven years later James fell in love with George Villiers, whom he later made the 1st Duke of Buckingham. When restoration of Apethorpe Hall was completed in 2008, a previously unknown passage linking the bedchambers of James and Villiers was discovered. Faithful to the end, Buckingham was at his side when James died in 1625 following a stroke. Oh, and the King James Bible is named after him. In 1604 James charged 47 scholars within the Church of England to undertake a new translation of the Bible into English, which was published in 1611 and still in use today. This year marks the 400th anniversary of its publication. 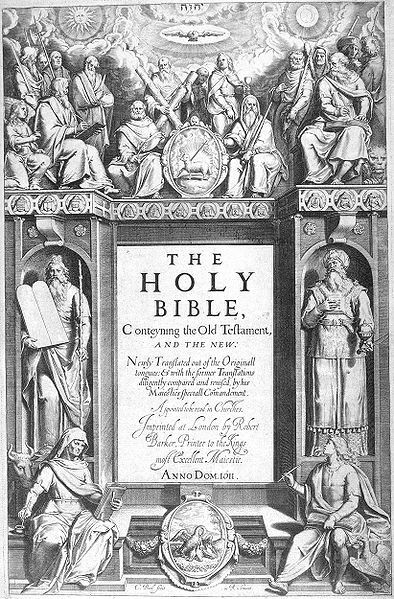 This illustration is of the title page of the first edition. nice. the bbc need to make a miniseries about this.